The law firm of Thomas Braun Bernard & Burke, LLP was founded with the goal of providing high-level legal representation to individuals and businesses in Rapid City and across South Dakota and Wyoming who need assistance with personal injury and wrongful death claims, business transactions and litigation, estate and personal matters, and professional liability defense. Our law firm believes that success comes from hard work and attention to detail. Our lawyers protect our clients’ interests both in and out of the courtroom. Our focus remains on our client, and we provide individualized attention and consultation every step of the way. Our experience and knowledge allow us to take on complex and large cases - cases that many attorneys are not comfortable handling. 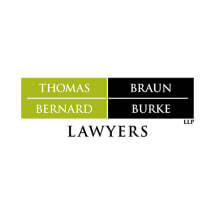 Thomas Braun Bernard & Burke, LLP is a litigation firm. From catastrophic personal injury and wrongful death claims, to high-stakes business litigation, to professional liability defense, we are comfortable fighting for our clients in court. The ability to go to trial is important – you are at a disadvantage at the negotiation table if the other party knows that your attorney is not comfortable going to court. We have worked hard to build our firm’s reputation, and take pride in the fact that most our clients are referred to us by former clients and other lawyers, who have first-hand familiarity with our work. Although a law firm can never guarantee a particular result to a client, we believe that it is our commitment to hard work and attention to detail that has resulted in significant recoveries for our personal injury clients, our successful results in business disputes and litigation, and our successful defense of numerous professionals.